So you take a piece of luggage out of the closet and your pet, whatever it is, runs to fill the void. And then it sits there, staring at the wall, waiting for it to melt, or waiting for you to melt, or something of that sort. It means Friday is near. And when Friday is here, so is Ennealogic. 1. A bunch of slow-mo things getting wrecked in slow-mo. Dune got it wrong. Time is the mind-killer. 3. Summer Concert Series at Chicago’s Millenium Park. The key word here is ‘free.’ Always exciting this time of year when the folks behind the Millenium Park Summer Concert Series release the schedule. Our special interest is on the June 14th gig with Deerhoof headlining the whole spiel. 4. Artists rehashing thrift-store artwork in the best way possible. 5. That we received a review copy of Robert Bolano’s The Secret of Evil. Sometimes being a publisher and running a website and all that… it has its benefits. 6. That Anobium V1 and V2 are now available at 57th Street Books in Chicago’s version of Hyde Park, which is also called Hyde Park. We made the rookie mistake of not first calling to announce our intention of bringing Anobium down to Hyde Park, but like the Gideonites with their Bibles, we just show’d up and let the books do the talking. 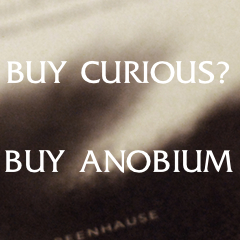 Next time we sojourn down to U of C territory, our plans are to find empty shelves under the ‘Anobium’ section. $10 a pop. 7. Die Antwoord, bizarro S. African rap group, teams up with Harmony Korine, bizarro N. American film director. I – the editor – need to weigh in here: when Die Antwoord first went viral with their ‘Enter The Ninja‘ video, I said, “this looks like a Harmony Korine b-side.” And lo and behold, here we are. 8. Roundworms have a language. That is to say, roundworms, the things that live only to feed on the flesh of others, have a language. Roundworms are one crucial step away from a 1950’s-style existential crisis. 9. Anobium poster spotted at Quimbys.